A Family weekend at RH & DR Railway with special trains running to see Peppa Pig at intervals at New Romney station. Pre-booking seats on the special train is essential. of the landscape of the Romney Marsh. Known as “Kent’s Mainline in Miniature”, the World Famous one-third full size Steam & Diesel locomotives have powered their way along the 13½ miles of track from the Cinque Port town of Hythe, terminating in Dungeness; a National Nature Reserve and one of the largest shingle landscapes in the world. 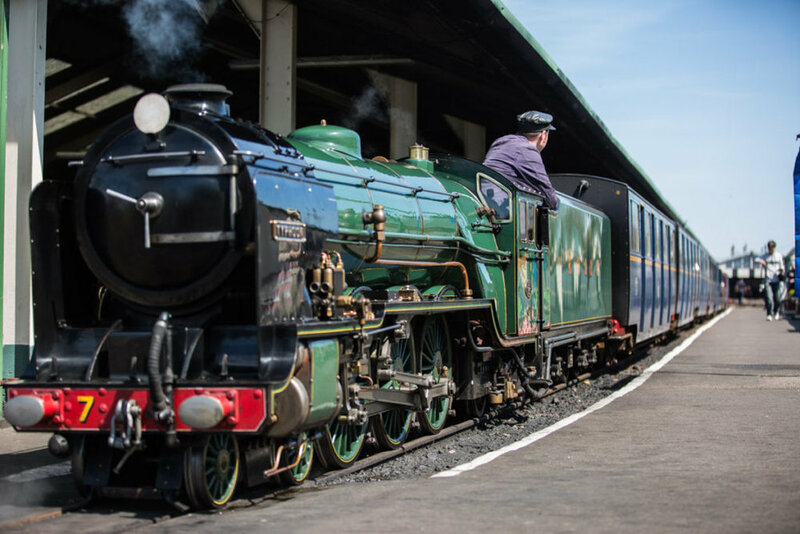 With 4 stations in between, all within walking distance of a beach, the railway provides you with an opportunity to explore this unique corner of Kent. Coast & country walks, with all manner of wildlife & flora to be seen, cycle rides, medieval churches and iconic Lighthouses are all on our doorstep. With excellent catering facilities available at some stations, the ever-popular Model Railway Exhibition, 1940’s Museum and Play Park at New Romney Station, good station shops, free car parking and facilities to assist Disabled visitors, RH&DR is the perfect any-weather, all-generations great day out.